Since the Blackmagic Production Camera 4K isn’t out yet at the time of this writing most of this guide is conjecture – the result of relying on information provided by Blackmagic Design, educated guesses and my personal experience and analysis. It is only a starting point, from which you will hopefully continue to research and find what best suits your workflow. The information provided here might not be accurate or relevant. You are solely responsible for your decisions and actions. In Part One we looked at ergonomics and specifications of the Blackmagic Production Camera 4K. In this part we’ll look at lens options, filters, matteboxes and follow focus systems for the camera. 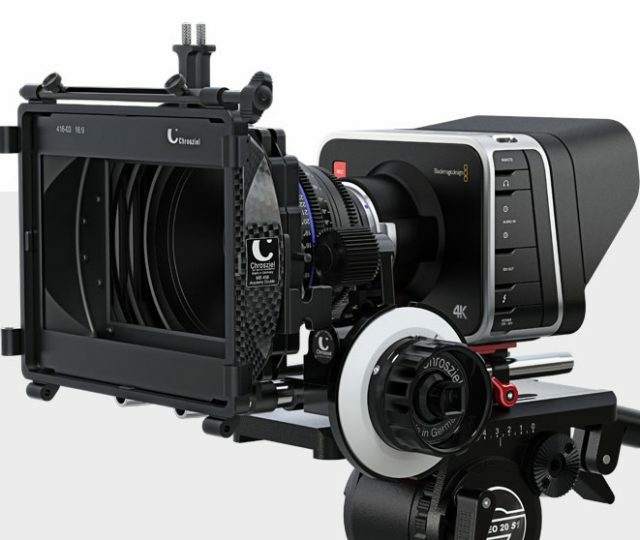 The Blackmagic Production Camera 4K sensor measures 21.12 mm x 11.88 mm. 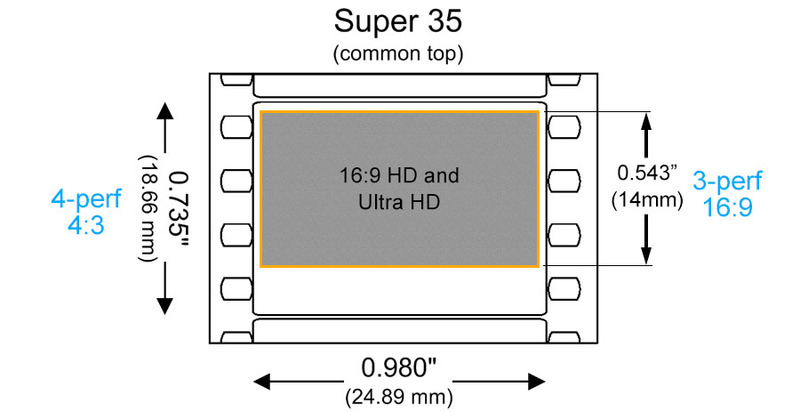 Slightly smaller than traditional Super35mm, but it’s nothing to bicker about. The resolution is 3840 x 2160 (or 8 MP). This size to resolution ratio will reduce artifacts caused by line-skipping and incorrect interpolation (downsampling) that you find in DSLRs. The sensor demands a lens that can deliver a resolution of 182 lines per mm, or 91 line pairs per mm. In plain speak, you need a really good lens. No, let me make that clearer – you need a top-of-the-line class lens to extract the full resolution this sensor is capable of. The lenses are designed to cover a larger full frame area, so any aberrations like vignetting, resolution drop off, etc., at the corners will be cropped by the smaller sensor of the Blackmagic 4K Camera. They are primarily designed for highly demanding still-camera sensors (FF demands 160 lines/mm, while APS-C demands 232 lines/mm), so they should be able to resolve 182 lines/mm. They come in both cheap and expensive versions and are widely available, with apertures from f/1.2. You can adapt Sony A, Nikon F, Leica R, Pentax K and Arri PL-mount lenses to the EF mount (see table below). Unlike the other two Blackmagic cameras, this one is easier to lens in terms of focal length. However, in terms of f-number, it’s tough to focus at an aperture like f/2 and lower – especially with 4K. Any slight focusing errors are ‘magnified’ thereby more distracting. Therefore, unless you know precisely what you’re doing, it is better to stick to f/2.8 and higher. This does not mean you can’t get a T1.5 or T1.3 lens, it just means you might want to stop down for practicality’s sake. I have already explained (in the links provided above) why I think a professional lens should have an f-number of f/2.8 or lower. The lower the f-number the better. As a general rule of thumb, a lens reaches its maximum potential two stops down. E.g., if you buy an f/1.4 or T1.3 lens, its best performance is likely at f/2.8 – until f/5.6 (for Super 35mm sized frames). Beyond f/5.6, you will start to see the effects of diffraction (f/8 is just about okay, but f/11 will definitely appear soft). Get a lens that covers full frame 35mm if possible. Get a lens that will allow you to use a follow focus system easily (more later). Get a lens that has an f-number of f/2 or lower. Use your lens at f/2.8 to f/5.6 as much as possible. If your lens starts at f/2.8, test it against f/4 to see if the image quality is good enough or not. Don’t forget to test at 1:1 crop on a good monitor, at 4K. Get an EF mount lens. Adapters not machined correctly will increase the chances of blur. Therefore, it is a wise strategy to avoid adapters if you can. I’m not including top-of-the-line cinema lenses, which for me, are the Arri Ultra and Master Primes, Cooke S4/i and S5/i primes, the Leica Summilux-C primes, and the Angenieux zooms – all in the PL mount. The numbers in brackets signify the approximate 35mm full-frame equivalents. Unless stated, all lenses are in the EF mount. Cinema lenses are usually manual focus. Between Zeiss and Canon cine lenses, I prefer Zeiss. Zeiss 85mm f/1.4 ZE Planar T* Manual Focus (145mm) – not exactly cheap! Both are way too expensive! The last two are super expensive! *I don’t recommend the use of fisheye lenses. Correction is an additional post processing step, and you also lose some of the ‘wide-ness’. E.g., an 8mm fisheye after correction will almost become a 12mm or thereabouts, so why not use a 14mm instead and save yourself the trouble of correction? Also, correction reduces resolution. All in all a bad idea. Wow. With all these options, it is somewhat hard to pick the right lenses. Nobody can test all of them! I’ll give you my personal picks, but before that, let’s quickly look at adapters. I don’t recommend using adapters for the Blackmagic Production Camera 4K, unless they are top-class and guarantee perfect shimming. Arri PL: Fotodiox Pro or KCWtechnica V1A PL-EF – not all PL lenses will work. E.g., Cooke S4/i and S5/i won’t work. Don’t buy an adapter until you know for sure whether your desired lens will work with it. This would be like a full kit, ready to tackle most situations. However, we’re not breaking the bank here. Sigma 35mm f/1.4 DG HSM Art (60mm) – this is sort of redundant except for when I need maximum image quality and that additional low-light ability. If you wanted three primes: From the 4-primes kit, I’d drop the 14mm f/2.8L. 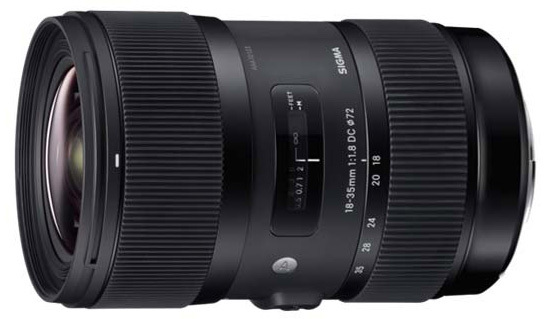 If I had the choice of one and only one lens, I’d pick the Sigma 18-35mm f/1.8 DC HSM (31-60mm). At f/2.8 there are few lenses better than this one. However, if you want image stabilization and weather protection, the Canon 16-35mm f/2.8L might be better. Important: Regarding IRIS control, we don’t know which lenses will work and which won’t, so if that’s a factor, wait till the official reviews are out. I’ve covered filters in great detail in the Guide to Lens Filters so I won’t be going into them in detail. However, one kind of filter that will definitely come handy is the ND or variable ND filter. You must find an ND filter that fits the filter thread of your lens. For filters, I recommend Singh-Ray and Heliopan . To learn about matte boxes, and whether you need one, read the Guide to Matte Boxes. Matteboxes will make your rig seriously front-heavy so you must pay attention to your rig. Don’t forget to match them against the front diameter of your lens. This is one camera that would greatly benefit from a follow focus system. It does have a 1:1 crop zoom mode for focusing, as well as focus peaking – but neither is very useful outdoors because the screen is bad (assuming it’s the same screen from the BMCC), even with the hood. Also, neither the zoom mode nor the focus peaking is available via SDI. A good focus pulling system, along with a good focus puller, will save you blushes in post. For cheap but reliable, try the Genus G-SFOC Superior Follow Focus System. An ever better option is the Letus Follow Focus system. The ultimate follow focus system for this camera is the Arri MFF-2 Follow focus system. In Part Three we’ll look at monitors, viewfinders, audio and power supplies. Your post says the Canon 16-35 L lens has stabilization. Are you thinking of the previous model? The slower lens with Is? Because the lens you mention is fast but does not include image stabilization. Thanks this is very informative! Do you have an adapter you would recommend if I’m looking to use Pentax k glass on the production cam? Thanks! This is the best and most useful info I have seen concerning the BMCC. JackBackToZero That’s tougher. Any Angenieux should be good though. Thank you sir! Any “affordable” zoom recommendations for PL? Love, love this! Thank you Sareesh! Do you have a breakdown for “affordable” PL mount lenses?… what set you would go with to cover the focal range? Zooms vs primes, etc? (I’m going to grab a Ursa mini) Many thanks! decoy studios The focal length is not related to the crop factor. It will be 18mm on any sensor. The crop factor will apply on that based on the size of the sensor. 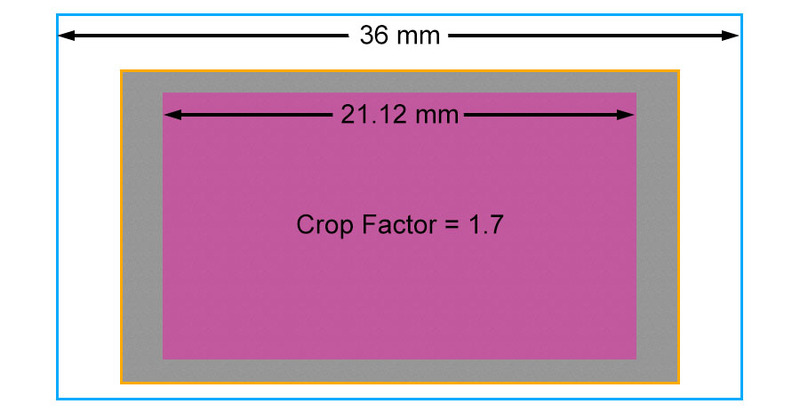 I have an article on crop factor on the site you might want to check out. Hi Sareesh, I got a little confused about the 18-35mm sigma lens. Since the Sigma is an APS-C lens there is no crop factor on the BM 4K camera is it? Hi, for documentaries, interviews, usually with bad light conditions.. what would you recomand for a lens ? MrQsyea Only for the micro four thirds mount. The Tokina 11-16 f/2.8 is pretty good, and wide. thanks for this i have a BM 4k but had a 5d mark 2 before and I’m trying to find a way to get as wide as i can. this helped a lot. L C Thanks for sharing! I prefer the LanParte follow focus. First and foremost it has “Zero” play. I also like the feel of the knob better. It has equally good build quality and is cheaper.